John's half sister Julia's opinion of the Albert Goldman book. IN HER OWN WORDS FOR "HELLO! 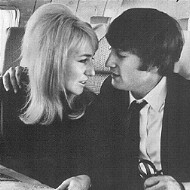 MAGAZINE"
23 April 1994 The legendary Beatle's first wife Cynthia Lennon tells us how she has finally found peace and why she has decided to write the story of her life with John Lennon exclusively for "Hello! Magazine". 30 April 1994 I have a happy childhood but at 17 my beloved dad's death devastates me. My mum encourages me to fulfil me art college dreams. There I meet and instantly dislike a student named John Lennon. 7 May 1994 John and the other Beatles play the Cavern and go on to be a huge hit in Hamburg. I meet Astrid Kirchherr who gives the boys their famous haircuts. Madly in love with John I fail my exams and become pregnant. 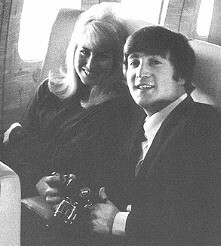 14 May 1994 We get married but as the Beatles take off I have to pretend I'm just John's girlfriend. Stuart Sutcliffe dies tragically and Ringo joins the Beatles. Julian is born and we honeymoon belatedly in Paris. 28 May 1994 John gets heavily into drugs and I welcome him trying meditation. Brian Epstein dies and we go to India where John receives letters secretly from Yoko Ono. My worst fears are realised when I find them together. John tries to divorce me on the grounds of my adultery. 4 June 1994 Divorce proceedings begin. 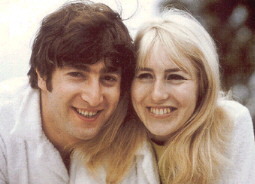 I read about John's bizarre exploits with Yoko in the newspapers. The Beatles split up and I remarry, twice, unsuccessfully. Julian and I go to America where I see John for the last time. Following the success of the Hello Series, Cynthia and her son Julian did further exclusives for the magazine.